Where to find key locations needed to complete one of the Week 10 challenges in Season 6 of Fortnite. Players looking to complete one or more of the Week 10 challenges in Season 6 of Fortnite have been asking where to find the Crashed Battle Bus, Viking Ship, and Camel locations. Personally, we feel this is one of the easier Week 10 challenges as you simply need to visit these areas (no dancing required). Of course, the challenge specifies that all three locations be visited in a single match. If you don’t know where to look, it can certainly be stressful to roam around blind during a match. To help simplify the process, we’ve put together a quick guide on where to find the Crashed Battle Bus, Viking Ship, and Camel locations in Fortnite! Where to find the Crashed Battle Bus, Viking Ship, and Camel locations in Season 6 of Fortnite. As stated above, finding the Crashed Battle Bus, Viking Ship, and Camel locations is one of the latest Week 10 challenges in Season 6 of Fortnite. To complete this challenge, you’ll need to find and visit each of the three locations all within the duration of a single match. By completing this challenge, you’ll be rewarded with five Battle Stars. Having a hard time finding one or more of these landmarks? Below, we’ve listed the exact locations of each one in Fortnite! Crashed Battle Bus: The Crashed Battle Bus landmark can be found outside Lazy Links to the South and West of the dig site. Viking Ship: The Viking Ship landmark can be found at the edge of the waterfall near Viking Village. Camel: Finally, the Camel landmark can be found to the South and West of Fortnite’s desert area. 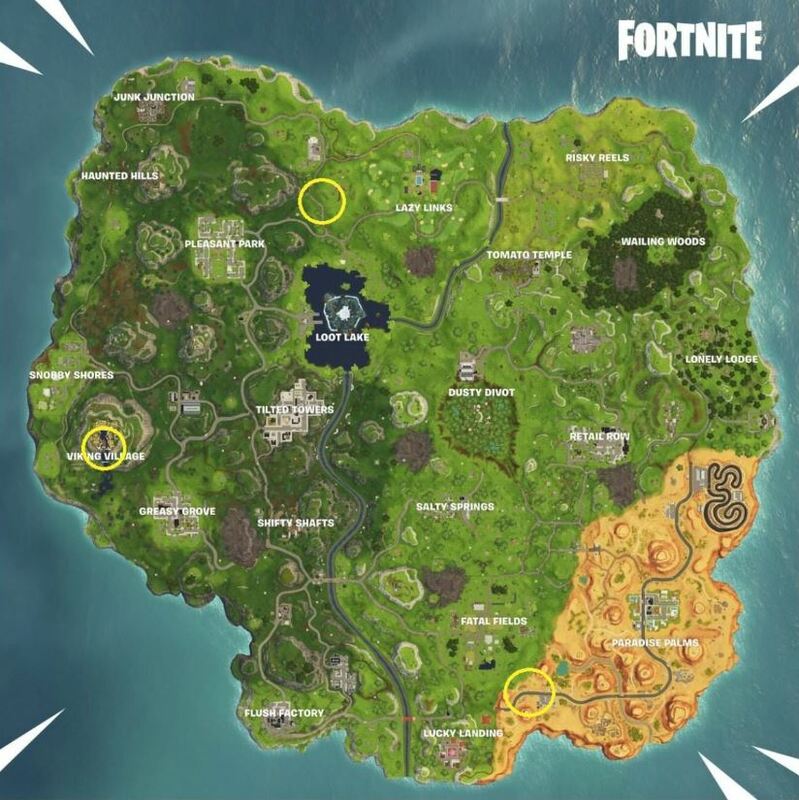 If written directions aren’t your thing, we also have each landmark circled on the Fortnite map in the image above. You’ll know you found the landmark – and that it has been counted towards your overall challenge progress – when the challenge pop-up appears on your screen. By finding and visiting all three landmarks during a single match, you’ll be able to complete one of the Week 10 challenges in Fortnite and earn five Battle Stars for your trouble. Which of the three landmarks was the easiest for you to find? Let us know down in the comments below! For more on Fortnite, be sure to check out some of our previous features including how to send gifts in Fortnite, the new trap added in Season 6 of Fortnite, and the news that McFarlane is producing collectible Fortnite figures! By reading through this guide, you should now know where to find the Crashed Battle Bus, Viking Ship, and Camel locations needed to complete one of the Week 10 challenges in Season 6 of Fortnite.